Google Chrome Critical Error is the PUP that uses misleading techniques to prevent removal. Use Reimage to locate malicious components and get rid of them faster than with uninstall instructions. A full system scan blocks virus reappearance and prevents traffic to malicious domains. 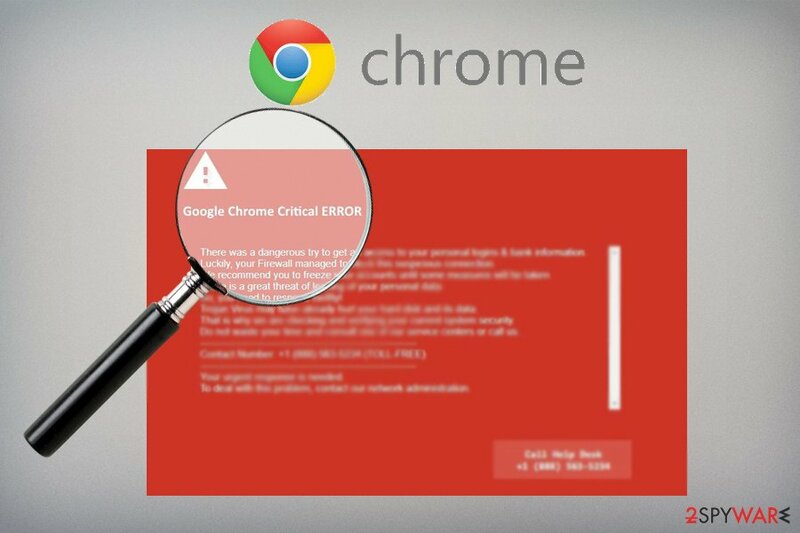 Google Chrome Critical Error is a fake pop-up alert that may show up out of nowhere during internet browsing sessions. Visually, the red page resembles a legitimate Google Chrome warning that appears when users are about to visit a dangerous site. Instead, users are presented with a lengthy message, claiming that a trojan horse may have already damaged their hard disc files and, as a result, some of their personal data is at the risk. To “fix” the issue victims are then prompted to call “Help Desk” via the provided telephone number. No matter how convincing the Red screen virus seems, you should never fall for dialing the number given in this alert because scammers behind it can trick you into installing malware, paying for useless services or giving them a remote access to your PC system. 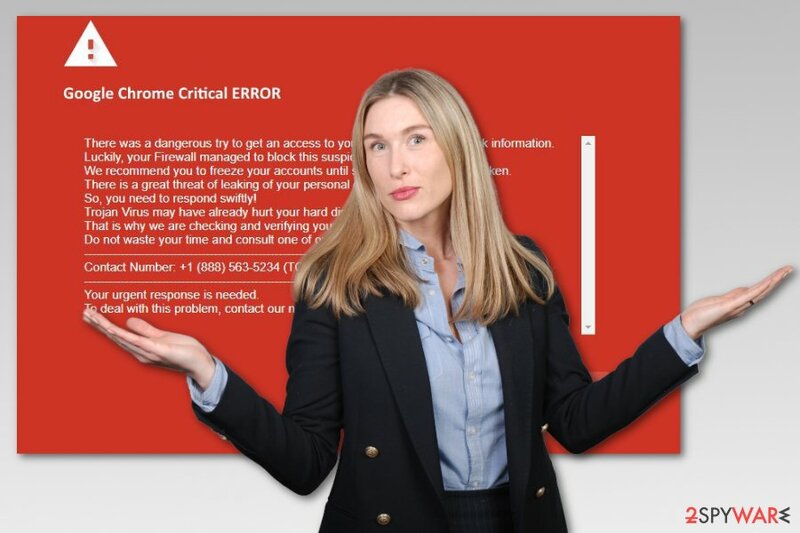 Google chrome critical error red screen virus is a technical scam that belongs to the group of Critical ERROR scam that target Internet Explorer, Microsoft Edge, and Mozilla Firefox web browsers. Hence, Chrome users are also in the target eye of tech support scammers. 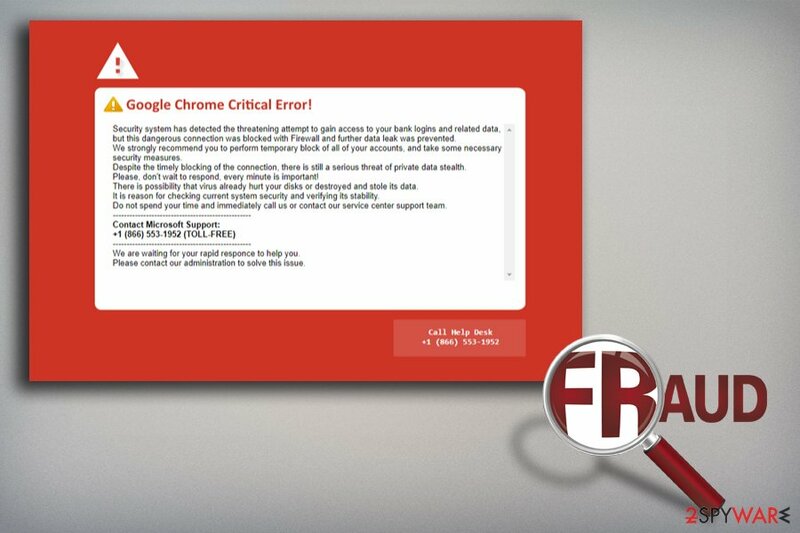 Just like many other online scams, this Google chrome critical error red screen also aims to trick users into calling fake technicians due to computer infection or possible threats to their private information. Authors of this scam use +1(888)-562-5234 phone number. However, security specialists from Los Virus warn that crooks might use countless other numbers. 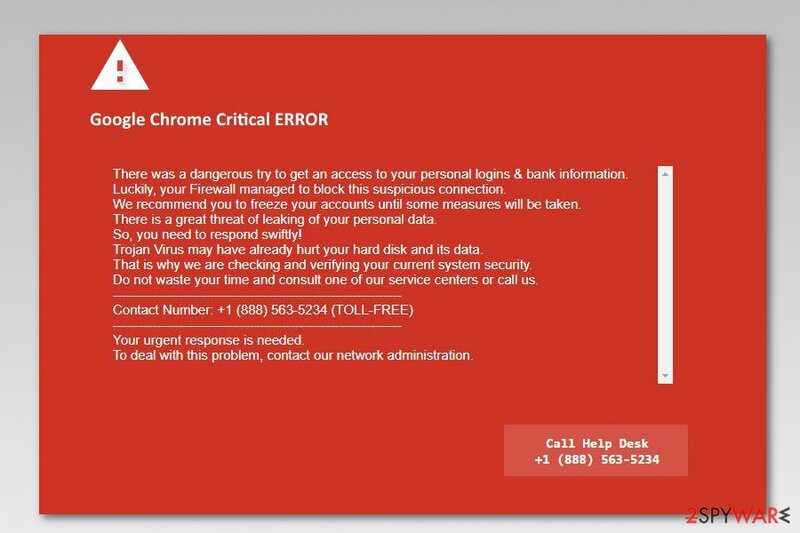 Google Chrome Critical Error is a technical support scam that targets Chrome users. However, calling authors of Google Chrome Critical Error will bring you even more computer-related problems. Crooks might want to sell you useless security software, get remote access to your PC, install malware or steal personal information. Hence, do not call them or make a contact with the help of other methods, e.g. email, text messages, etc.! If redirects to this site keep reappearing, you should remove Google Chrome Critical Error red screen virus immediately. Keep in mind that this PUP may have arrived in your system as a browser extension or any other potentially unwanted program, so system investigation is highly recommended for the full virus removal. However, you can speed up Google Chrome Critical Error removal by scanning the system with Reimage or another anti-malware software. Make sure you get rid of all apps that you can't remember installing. After the scan is finished, we highly recommend resetting Google Chrome web browser. Users typically call fake tech support because they get scared that their computer and personal data may be at risk, especially if they never death with such a fake screen before (mind that some scams might lock the screen to make it more believable). Victims typically have no idea that the fake pop-up message came from adware which infiltrated their machines via software bundling. That is why such scams can be hugely successful, and crooks will continue to abuse naive individuals. Nevertheless, it is relatively easy to protect yourself from adware and other PUPs. Despite freeware developers' recommendations, never pick Recommended/Standard/Quick installation settings. Instead, opt for Advanced/Custom mode. This way you will be able to remove all the tick marks next to optional installs before the process is complete. Additionally, we advise users to learn about scams, how to recognize them and how to avoid them if the skimming attempt was made (as we already mentioned, people may be redirected to phishing site even without their PC being affected by adware). Redirects to technical support scam will stop when you remove Google Chrome Critical Error virus from the affected machine. For that, you have two options. The first one suggests locating and terminating adware manually by following the steps below. Beware that this method requires your full attention as incorrect procedure might hurt your computer instead of fixing it. Also, be patient, as manual elimination of red screen virus requires some time to complete. The second Google Chrome Critical Error removal method is more straightforward than the first one. It requires obtaining anti-malware program and scanning the device with an updated tool. If you have adware on your system, it would not be surprising if there would be other PUPs installed as well. Thus, automatic removal can also help you find additional unwanted applications quickly and get rid of them for good. If you have already contacted cybercriminals, you can report the fraud to your local authorities. Additionally, in case you paid for something, contact your bank and ask if reverting payment(s) is possible. Here, look for Google Chrome Critical Error or any other recently installed suspicious programs. Wait until you see Applications folder and look for Google Chrome Critical Error or any other suspicious programs on it. Now right click on every of such entries and select Move to Trash. Uninstall suspicious add-ons and reset Google Chrome to get rid of red screen virus. Do not make any contact via the technical support scam website appearing on your web browser! Here, select Google Chrome Critical Error and other malicious plugins and select trash icon to delete these entries. Click Reset to confirm this action and complete Google Chrome Critical Error removal. When in the new window, check Delete personal settings and select Reset again to complete Google Chrome Critical Error removal. Once these steps are finished, Google Chrome Critical Error should be removed from your Microsoft Edge browser. Here, select Google Chrome Critical Error and other questionable plugins. Click Remove to delete these entries. Now you will see Reset Firefox to its default state message with Reset Firefox button. Click this button for several times and complete Google Chrome Critical Error removal. Here, select Extensions and look for Google Chrome Critical Error or other suspicious entries. Click on the Uninstall button to get rid each of them. Now you will see a detailed dialog window filled with reset options. All of those options are usually checked, but you can specify which of them you want to reset. Click the Reset button to complete Google Chrome Critical Error removal process. ^ Robert Abel. Tech support scam used to spread cryptominer Coinhive's Monero. SC Magazine. Breaking news on cybersecurity, cybercrime, industry insight and security product reviews. ^ Scam Alert: Beware Scare Tactics. IDShield. Personal data leak prevention techniques. ^ Jonathan Strickland. How to Detect Online Scams. HowStuffWorks. Tech information site. 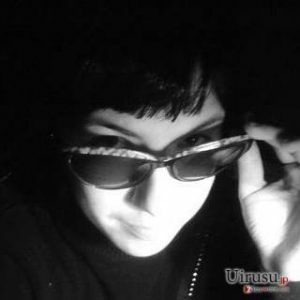 This entry was posted on 2019-04-01 at 01:52 and is filed under Adware, Viruses. You can quickly scan the QR code with your mobile device and have Google Chrome Critical Error manual removal instructions right in your pocket. How did you remove Google Chrome Critical Error?